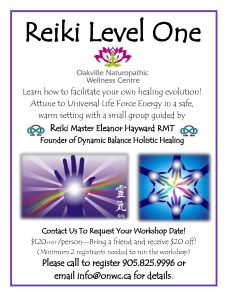 Take the initiative to facilitate your healing journey and become attuned to Reiki energy! Reiki (pronounced Ray-Key) means Universal Life-Force Energy in Japanese. This non-invasive ancient healing art balances your body mind and spirit naturally. Through the life energy we all possess, Reiki practitioners are able to channel this healing through specific placement of the hands. Reiki encourages relaxation, a clear mind, optimism, and better sleep. “Reiki is a very specific form of energy healing, in which hands are placed just off the body or lightly touching the body, as in ‘laying on of hands. The intention is to create deep relaxation, to help speed healing, reduce pain, and decrease other symptoms you may be experiencing.’” ~John Hopkins Integrative Medicine & Digestive Center’s Complementary and Alternative Medicine (CAM) program. 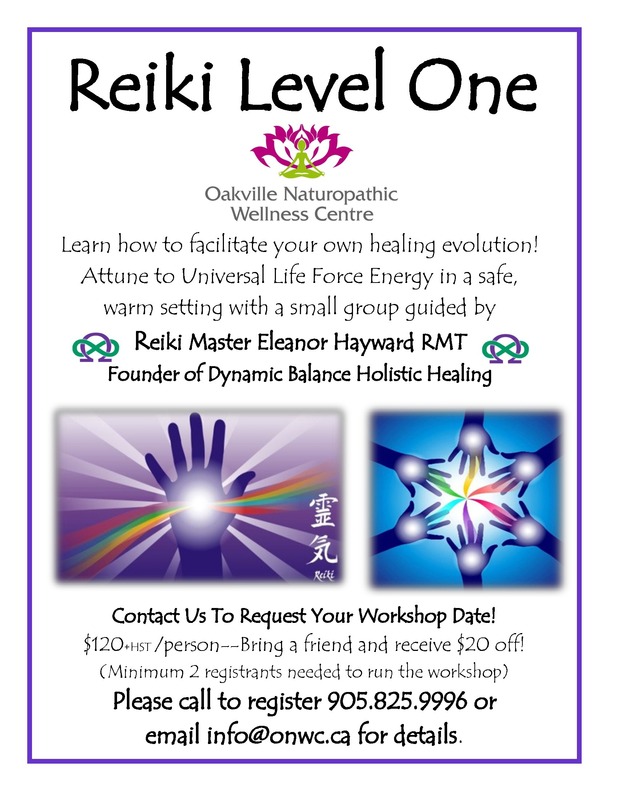 Eleanor Hayward RMT & Reiki Master has more than 10 years as a trained health professional in Halton, and is an avid student of spiritual and self development. She is passionate about helping others to help themselves. The registration fee is $120+hst, with $20 off when you bring a friend (Minimum 2 registrants needed to run the workshop). This includes a theory component with manual, attunement, hands-on practice, certificate and a healthy snack! Please contact us to request your 4-hour workshop date and time! Attend Be Yoga & Wellness facility by calling 905.634.5852 or call 416.275.3011 for Eleanor to visit your home in the GTA.